A driving instructor is generally a self-employed person who works alone or for a driving school. A driving instructor will make recommendations as to where they see a learners driving is at in regards to them putting in for the practical driving test. There are currently around 40,000 approved driving Instructors registered with the UK’s governing body, the DVSA. There Are Two Different Types Of Driving Instructor – ADIs & PDIs. An ADI (Approved Driving Instructor) is a fully-qualified instructor who has been tested and registered by the Driver and Vehicle Standards Agency (DVSA). UK law requires driving instructors to be qualified before they are able to charge for their services. Always make sure that you have seen your driving instructor’s green badge, which MUST be clearly displayed in the vehicles windscreen. The instructor may be not be licensed to provide driving tuition if they do not have a badge. A PDI (Provisional Driving Instructor) can be identified by a pink badge which MUST be clearly displayed, normally in the bottom left corner of the vehicle’s windscreen if they intend to be paid for any driving tuition. The pink training licence will mean that your driving instructor is still in the qualifying process and are yet to pass their final exams. It is an optional route for a person who wishes to gain their full ADI qualification to start teaching before they have fully qualified. Independent driving instructors are not governed by a driving school’s operating policy. As a result of this, they will vary enormously in the standard, service and training that they provide. A common misconception by the general public is that ALL driving instructors are all the same. This certainly is NOT the case and although fully qualified instructors would have passed their qualifying exams, they still vary enormously in the standards of both the customer service and level of quality tuition that they can offer. From the day that many driving instructors qualify, they will never take any further development training as it isn’t mandatory. We feel that it really needs to be and is the reason many instructors lack the skills and knowledge in order for them to be exceptional at their job. It would also be the reason that they might be lacking in recent developments such as client centred learning or (CCL). The “I say, you do” approach is dated and simply doesn’t work efficiently and effectively. The majority of the general public are unaware of this and often choose their driving lessons solely on price alone. This can be a big mistake and the “hidden cost of cheap” becomes obvious when a lack of progress is experienced and it is becoming a realisation that something isn’t quite right. Driving Instructors that take responsibility for their own development training are more confident in their ability to offer the highest standard of driving tuition and the price they charge will normally reflect this. Most successful Driving Instructors will have many favourable customer reviews to offer a completely unbiased view of their services and level of quality driving tuition. Driving instructors who have not taken the initiative to keep up to date will generally be the ones that offer “cheap” driving lessons and often advertise themselves as the cheapest Instructor locally, to attract enough work just to survive. When learning to drive, seek as many genuine customer reviews as is possible and don’t choose the cheapest lessons that are available. 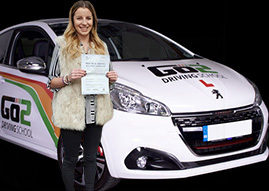 Go2 Driving School uses local driving instructors in Derby. Our instructors are fully qualified and no trainees (PDI’s) are used to deliver our driving lessons. ALL Instructors adhere to a strict code of conduct which can be seen in our mission statement. Mission statements are sent out to our customers at the time of booking. This way they know the exact level of high standards that they should come to expect when using Go2 Driving School. They are entitled to a full refund should they feel their driving instructor isn’t abiding by our code of conduct. Go2 Driving School conducts driving lessons in Derby using only fully qualified driving instructors that are CRB checked for your safety.